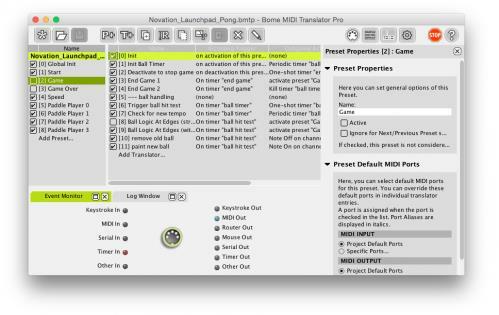 Bome Midi Translator Pro 1.8.1 build 839 MacOSX | Free eBooks Download - EBOOKEE! With Bome MIDI Translator Pro, you can control your computer from MIDI devices or other devices. For example: you can control your favorite software with a MIDI control surface, use MIDI turntables with arbitrary DJ software, map MIDI messages to other MIDI messages, and much more. You can create your own mappings by defining the translations, or use one of the many pre-existing translation presets. We are constantly working on new presets, and the active community continually expands the available pool of presets. MIDI Translator Pro works by specifying mappings for different input and output types. Below is a list of different trigger types (Incoming) and action types (Outgoing). You can combine them as you wish (e.g. do keystroke-to-MIDI conversion, or MIDI-to-mouse mapping). - labels and goto, e.g. goto "2nd Options"
new settings function: "Reset All Settings"
new settings function: "Remove all Aliases"
added setting "ignore incoming keystrokes if MT is active"
incoming MIDI action: if you specified "pp qq rr" as incoming action, "D0 71 90 34 7F" would not trigger. Now it triggers 90 34 7F. No comments for "Bome Midi Translator Pro 1.8.1 build 839 MacOSX".